Not a good week for Harry. We took him to the vet and found that he has mites - which means we have to use special shampoo every day. 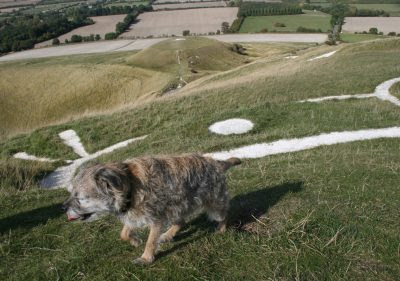 So for a treat today we took him up on White Horse Hill. 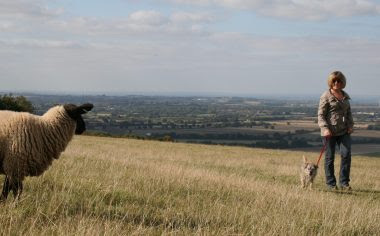 Harry has always ignored sheep up to now but today - maybe it was the mites or the effect of the shampoo - Harry barked and tried to run at this sheep. The sheep did stamp at him first so it was not all Harry's fault. 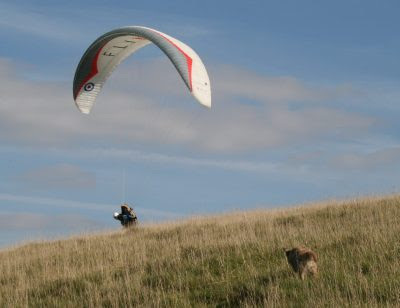 Then a bit later Harry ran up the hill barking to try to get at this Paraglider. He must have thought it was a big bird.